In the digital world, the differentiating factor is not the box, but how you appeal to people in a multi-sourced world. One article that came into my stream yesterday was a story over TechCrunch about how Vanity Fair could only send them an advanced copy via fax. It illustrated Vanity Fair's format-first nondigital workflow, one that is shared with many traditional media companies. Many years ago, I was working for a company that helped fashion companies to become digital. At one big fashion company (the second largest in the nation), we encountered this strange kind of print centric workflow. The designers would design the new clothes digitally, and then print it out. These prints would then be put into a folder and send it to the construction department. Here they would scan each one back into the computer to add instructions (basically an arrow pointing to a sleeve with a text box saying it should be x inches long), and then they would print it out again. They would then go over to the fax machine and fax it to China. The people in China would then respond by email, but every time they needed new instructions, the fashion company would again print out the page and fax it. I asked them, "why don't you just email it? ", and they looked at me as if I was completely insane. They told me, very firmly, that it was impossible because the people in China couldn't receive it. Apparently Chinese companies (the ones who communicated via email without any problems) weren't as advanced as western companies who were still using fax machines and communicating across departments by printing and scanning documents. We never managed to solve the fax issue. Their wrong perception of the capabilities of chinese companies was simply too strong. But we did manage to solve the print-scan-print workflow ...after some grueling fights with their IT department who insisted that each department mustn't have access to each others files. IT had apparently never heard about this thing called team work. When I hear that Vanity Fair can only do fax, I think back to this experience. Vanity Fair must still have a print centric workflow within the organization. The Vanity Fair publicist was most likely given a printed copy of next month's magazine, and it is the printed pages from this magazine that he is now faxing to other media companies. He cannot send a PDF to TechCrunch because he doesn't have access to any of the files, nor does he have the influence to tell the graphic department to make one for him (different bosses, different editors, and different organizational units). Neither can he scan it and send a PDF, as TechCrunch suggest, because with a print centric workflow the fax machine is probably not even connected to the network. What we are likely seeing is a company that work digitally (they created the page in InDesign and the publicist emailed TechCrunch), but their internal communication is still analog between organizational silos. They have updated the tools they use, but they have never changed how they work with them. We have to ask, why do they even have this workflow to begin with? Not just at Vanity Fair but also in so many other media companies. The answer is that it's a format first workflow. They are still defining their output based on the layout of the page over the actual words. Faxing is archaic, but even PDF is just another print format. Why didn't the publicist just copy/paste the story directly into the email itself? Or if you where truly digital, the article would already be in the CMS and all they needed to do was to send TechCrunch a private link. One example is how my friends over at Interaction-Design.org recently sent me a link when they wanted to give me (and my readers) an advanced copy of an book. It's not hard to do because the article is already in the CMS. It's just an article set to be private, instead of public. In a digital first workflow, you don't define your output by its format. You put the story first, and you assume that the story will appear different depending on where people read it. An article looks different in newsreaders from how it looks on your site, in an app, in a newsletter and on any other platform. With a digital first workflow, you become format-less. You turn the story itself into the format, and not the boxes and graphics around it. 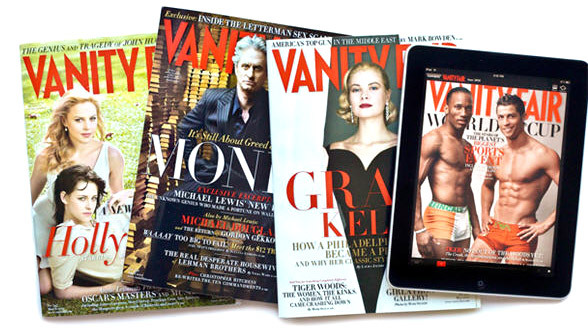 Vanity Fair, while a great magazine, is still a print company ...even when they do digital. Their iPad app is a format first app, designed around a print mentality and a print workflow. They define what they do by the visual outcome of the box it is in. And this is not just a problem at Vanity Fair, it's a problem with pretty much all traditional media companies. They have updated their tools, but not how they work with them. 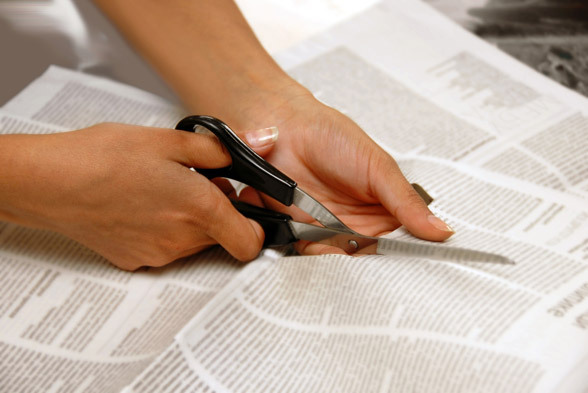 Get rid of the format first mentality, because it's what you do in print. In the digital world, the differentiating factor is not the box, but how you appeal to people in a multi-sourced world. Think Flipboard. How would you get people to add you as a source there? It's the story and how well you tell it that defines you. The pictures and graphics should not surround the story as graphical elements. It should be an integrated part of the story itself. And get rid of that fax machine. There simply isn't any reason why any company still have one. You can come up with all kinds of excuses, but the fact is that companies who don't have one work just fine. It's keeping you in the past. Throw it out - today! And while you are at it, get rid of most of your printers too. Only people who produce print should have on in their office (and that means no printers in the office where your editors and journalists work). A digital-first media company starts with a digital-only internal workflow.